These words from the “Letter from Kolkata” accompanied the visits a brother made recently in many places in the North of Germany. The international atmosphere in the youth meetings in Taizé and in the end of the year European meetings gives rise to hope. As they take part, the young people feel that they are not alone with their longing and that on every continent there are men and women who choose hope, men and women who communicate this hope through their lives and so bring light to others. But what happens once the young people return home? In fact, there too many people are living the same hope, in the parishes, the schools, in the most various places. In Hildesheim there is a center for young people called “Heilig Kreuz” (Holy Cross) that is also home to the diocesan office for pastoral work. Prayers with the songs of Taizé are regularly on offer. During the visit, a “Night of lights” took place in the nearby Kreuzkirche. Young people from the different churches of Hildesheim and the surrounding area prepared the evening together. Catholic, Lutheran and Reformed Christians joined up to prepare the instrumental accompaniment, the solos and the decoration of the church. There was jubilation when the song sheets ran out because more people turned up than were expected! The church was full to the brim, with many people sitting on the floor. At the end, the Easter light was passed round everybody. In Berlin, the Protestant youth church is quite recent. 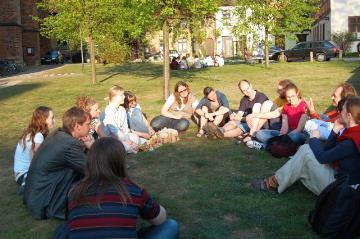 It is there that last year young people, with the Protestant chaplaincy in the area, invited Taizé for a meeting. Right there, in the middle of the metropolis, a church is being created with much imagination, a place that really wants to offer a “home”, especially to the young. A “talents competition” invites young people to creativity and to implementing new ideas, starting from very little: How can you do something starting from five Euros? Whoever wants to take part receives this small sum of money and tries to work out what he or she can do with it to contribute to the Jugendkirche (youth church). 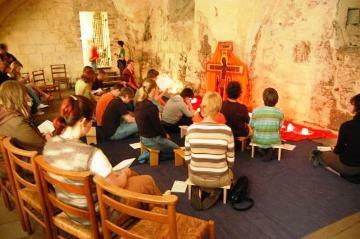 Some remember the experience at Taizé. There too we have so often experienced the fact that a very little is enough to begin with. Many take part and something beautiful can develop together. For the prayer, the icon of friendship was in a central place. After a biblical introduction, basic concerns in the life of each person were taken up in small group sessions. Some of the young people who meet regularly in Bremen had just spent the morning sitting part of their school leaving exam! In spite of that, in the afternoon they were very much to the fore for the bible introduction and the sharing groups. The meditation room at the parish centre had room enough for several groups. Others met in glorious sunshine in the garden. For the occasion, others came specially from Karlsruhe and Saterland.